Stampede has released its new Big Book of AV mobile app. The free app, available for the iPhone, iPad, and Android, allows users to browse Stampede’s 2012 catalog, featuring nineteen new product lines and a host of other innovative features, wherever they go. “With the new app, our dealers can have high quality AV information right at their fingertips,” said Kevin Kelly, Stampede president & COO. New lines featured in the 2012 Big Book of AV catalog include: Chorus Call (Unified Communications), Christie (Commercial Displays, Micro Tiles, Projectors), Clear One (Unified Communications), DynaScan (Commercial Flat Panels and Digital Signage Solutions), Horizon Displays (Classroom, Digital Signage, and Touch Screen Solutions), IO Gear (Audio-Video Distribution, Presentation Accessories, and Digital Signage), Navitar, (Non-Lens Digital Signage) Marshall Electronics (Security Cameras, Commercial Flat Panels, Unified Communications, and Microphones), Olens (Projectors and Home Audio), Panasonic (Security Products), Peerless (Non-Mount Digital Signage and Education Products), Phoenix Audio (Commercial Audio and Unified Communications), RADVISION (Unified Communications), Room Pro (Unified Communications, Carts/Racks/Cases, and Classroom Solutions), Samsung (Commercial Flat Panels), Screen Innovations (Projection Screens), TTUFF (Digital Signage Solutions), Ultimate Support (Pro Audio), and Xantech (ATON product line). 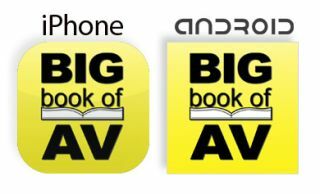 The physical version of the 2012 Big Book of AV was introduced to Stampede’s dealers at INFOCOMM 2012, and features information on more than 7,967 products from more than 90 manufacturers, making it the largest resource guide in the industry. The book itself weighs more than four pounds and is just shy of 1,000 pages. Dealers will have the opportunity to custom imprint their logo on the cover of the catalog. The 2012 catalog will include enhanced QuickLink barcodes. These codes allow readers to obtain further information about various product by scanning the codes with their smartphone, to be directed to digital information about the products on the page, either via videos about the products or a direct connection to one of Stampede’s call center representatives.